Dr Jenny Turner is able to offer High Volume Image Guided Injection (HVIGI) for Achilles and Patella tendinopathy. 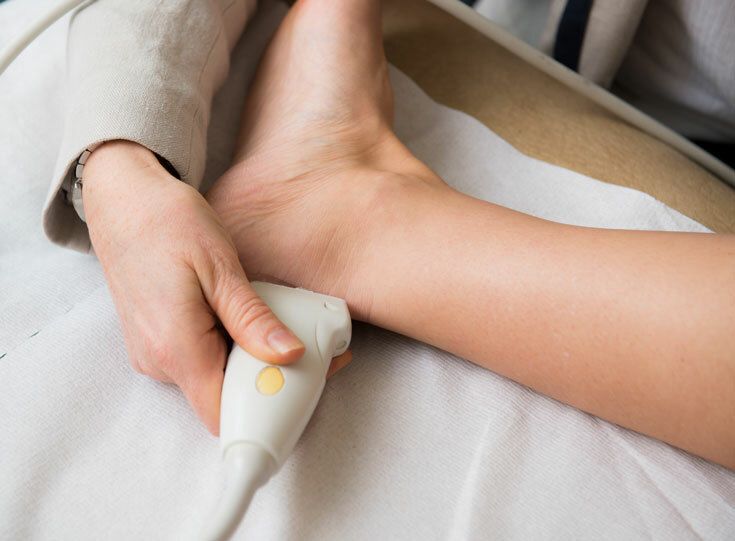 This is a high volume injection that utilises ultrasound to accurately guide the needle to the under surface of the Achilles or patella tendon. 10mls of local anaesthetic (Marcaine) and 40mls of normal saline (30mls for the patella), making a total of 50mls (40mls for the patella) of fluid are then injected under the Achilles tendon providing a non surgical stripping of the new blood vessels and nerves growing into the tendon. This is not a steroid injection and the fluid is injected under, not into the tendon. What are the symptoms Achilles and tendinopathy? Achilles and patella tendinopathy can cause pain in the heel or knee. Morning stiffness or stiffness with inactivity is common along with pain and stiffness at the start of an activity. This pain often improves after a few minutes of exercise but will usually come back after the activity and may be worse into the following day. What causes Achilles and patella tendinopathy? The most common cause of tendinopathy is an overload of the tendons such as walking, running and jumping activities. You may also have associated biomechanical factors such as stiff joints, tight muscles, neck or back pain with stiffness or sciatica. Systemic issues such as diabetes, obesity and some medication can increase the likelihood of tendinopathy. Tendinopathy is thought to be caused by abnormal repairing of the tendon due to an overload, this leads to a thickening and degeneration of the tendon with abnormal ingrowth of both blood vessels and nerves. There may be associated adhesion and tears of the tendon. The most important treatment for tendinopathy are specific exercises to gradually increase the load on the tendon both isometric and eccentric exercises, these are usually supervised by a physiotherapist. They may also suggest massage and a heel raise. Other treatment options include acupuncture; Shockwave therapy; High Volume injections; other injections (prolotherapy or PRP) and Surgery. You will feel a pinprick at the insertion of the needle and then a variable sensation of pressure or stretch during the high volume injection itself. This discomfort lasts approximately 1 minute. There will be swelling afterwards which will resolve over the next 24hours. An extended appointment with the nurse is needed for this procedure, which takes approximately half an hour. This includes a diagnostic ultrasound, discussion and explanation of the procedure and written consent. What are the complications of High volume image guided injection? Immediately some people feel faint after this procedure. There maybe a painful flare in 2 to 10% of patients with increased pain following the injection for 2 to 3 days. Numbness of the foot lasting 1 to 2 days is quite common. There is a small risk of infection and bleeding/bruising but this is rare and is the same risk whenever a needles pierces the skin. A tear or rupture of the tendon is an extremely rare complication. What can I do after the injection? Immediately after the injection we would advise gentle walking only with no running. You cannot drive until the day after the injection. Ibuprofen 400mgs three times a day for the first three days is recommended. It is very important to follow a strict rehabilitation programme beginning on day 4 following the injection. You will be referred to a physiotherapist who will help to supervise this programme. Based in St Martins, Dr Turner is our lead clinician and supported by a team of physiotherapists and osteopaths across all the Healthcare locations. Healthcare Group is very pleased to announce that Dr Blyth, who is based at the Cobo Surgery is now able to offer Ear Canal Microsuction to all of our patients.